A whole day of celebration that unites the past with the present, through food, wine, music, workshops, lectures, screenings, auctions and lotteries will be held on Sunday from morning till night in Pyrgos. The all-day event will be dedicated to support of the excavations ​​at the archaeological site and the conservation laboratories of Akrotini, which, due to the financial crisis, have been forced to close down after 47 years of continuous operation and success. 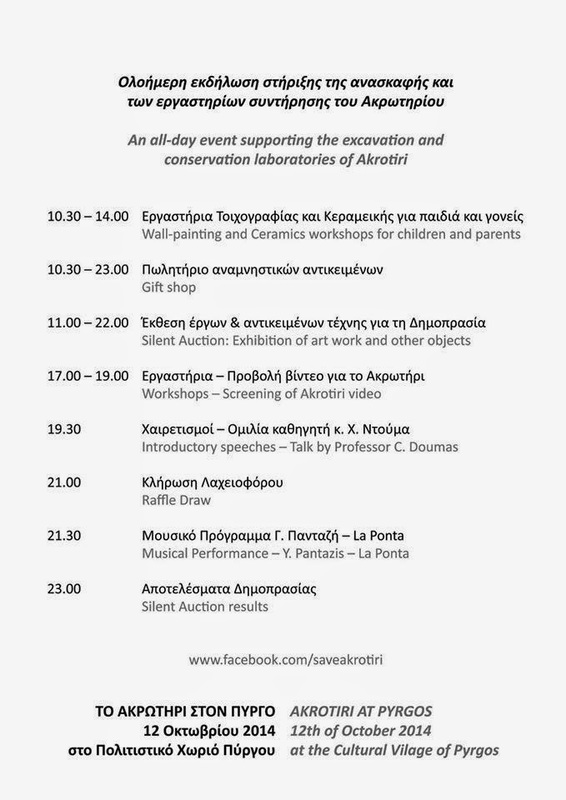 The program therefore includes different events: wall painting and ceramics workshops for children and parents (10.30 - 14.00), screening of Akrotiri video (17.00 - 19.00), speech by professor Doumas (19.30) and musical performance (21.30). At the same time, a silent auction of art works and a raffle draw will take place. Thus, the purpose of the day is the money collected to be given solely to the Society for the Promotion of Studies on Prehistoric Thera, so that the laboratories can open again. Those who want to join and support the work done in Akrotiri, can come on Sunday at the Cultural Village "Santorini of the Past” in Pyrgos. Free admission.